Restoring an antique dry sink is rewarding. Adding an antique dry sink to your home is a quick way to give it a vintage look. Whether you love primitives or Victorian design, a dry sink will fit right in. Dry sinks were used to hold the pitcher and wash basin that were standard in any well equipped home. You might find a dry sink in the kitchen or bedroom area, and more than one farmer's wife kept one on the back porch. The dry sink was a cabinet with a recessed area on top. More expensive dry sinks had these areas lined with copper or other waterproof material. The recessed area kept the water from the pitcher and bowl contained while someone washed up. The dry sink also had storage areas where extra towels and personal items would be kept. Generally there was a hook, bar, or other device to hang up the towel. Dry sinks were often made of pine, but in more affluent homes any wood might be chosen. During the Victorian era the tops of dry sinks might have been level rather than recessed, and had a slab of marble across the top for the pitcher and basin to rest upon. So versatile is this piece of furniture that you can add it to almost any room. It is a nostalgic addition to a large country kitchen, piled high with cookie jars and other collectibles. In a Victorian bedroom it looks just right with a pitcher and bowl, and it can be transformed into a bathroom vanity as well. Unfortunately, dry sinks are among the most copied antiques out there. 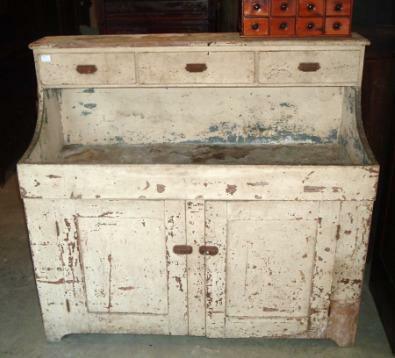 Unscrupulous dealers and others can create an old or primitive dry sink from a new one in a matter of hours.By stripping new pieces, repainting, sanding, and using various techniques for distressing the dry sink it can be made to look well worn to the novice collector. Other techniques include using reclaimed wood to build dry sinks that look old. There is nothing wrong with this practice as long as the item is clearly presented as a reproduction. So, how can you spot a fake? The very first things you should look at are the dovetail joints in the drawers. Reproductions will have five or more dovetails that are even and machine cut. Old pieces will normally have three and they will not be exactly the same. There will be some small differences in the shapes and the way that they are cut. It will be obvious that these are hand carved. In addition, the collector should check the ends of any boards that they can see. If the wood has been cut with a circular saw there will be swirls in the cuts. To detect use of reclaimed wood just look carefully for nail holes and areas where the nail holes have been filled in with putty and stained over. Almost any local antique store will carry a dry sink sooner or later. Rarely you can find them at thrift stores. If you happen to live near a historic section of town you can also keep an eye on garage and tag sales. Many times people will clear out everything during an estate sale because going through everything is too stressful. Remember to ask lots of questions and be sure that you understand the seller's return policies. Always read any feedback that has been left for the seller so you can get an idea of his sales ethics. It isn't a bad idea to look at several other dry sinks to get an idea of value. Dry sinks can create a country ambiance almost anywhere that you put them. Be patient and eventually you are sure to find one that you love.